Ujire, Dec 17, 2015 : The golden jubilee celebrations of SDM - Sri Dharmasthala Manjunatheshwara College, Ujire, will commence today December 17, and continue till December 18. 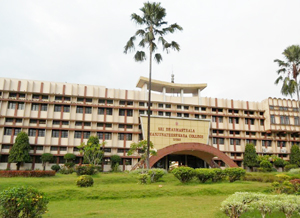 The college was started by the then Dharmasthala Dharmadhikari Ratnavarma Heggade in 1966, it was developed by the present Dharmadhikari Veerendra Heggade. At present five undergraduate and 12 postgraduate courses are being offered. There are 56 class rooms, 20 audio-visual rooms, three seminar halls and 15 science laboratories. The celebrations will be inaugurated by Sukhabodhananda Swami of Prasanna Trust, Bengaluru, in the presence ofDharmadhikari Heggade, Law and Parliamentary Affairs Minister T.B. Jayachandra, Belthangady MLA K. Vasantha Bangera and Mangalore University Vice-Chancellor K. Byrappa at 6 pm today December 17 at Sri Ratnavarma Heggade ground. The golden jubilee celebrations would also see the inauguration of a swimming pool on the college campus. DK District in-charge Minister B. Ramanath Rai would inaugurate the pool and attend the function at Indraprastha auditorium on December 18 at 10 am. Various cultural programmes too are slated for the celebrations. Madhura Sangeetha will be rendered by Raghu Dixit, Bengaluru, on December 17 from 8.30 a.m. at the ground while there will be a music ensemble by Arka on December 18 from 6.30 p.m. The evening will also witness a ’Theyyam’ performance by Santosh and troupe, Kannur, and Mahishasura Mardini by Purulia Chchavo Dance, West Bengal.